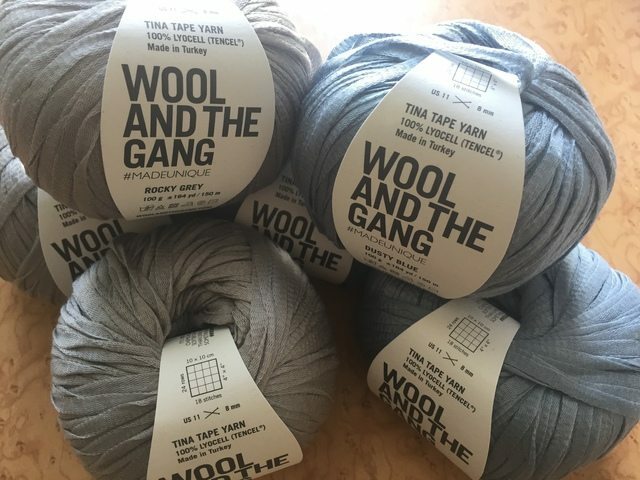 Wool and the Gang came out with a new type of yarn called Tina Tape Yarn that they sent to me to test out. I used this yarn to crochet my own dress, and I’m quite happy with it. 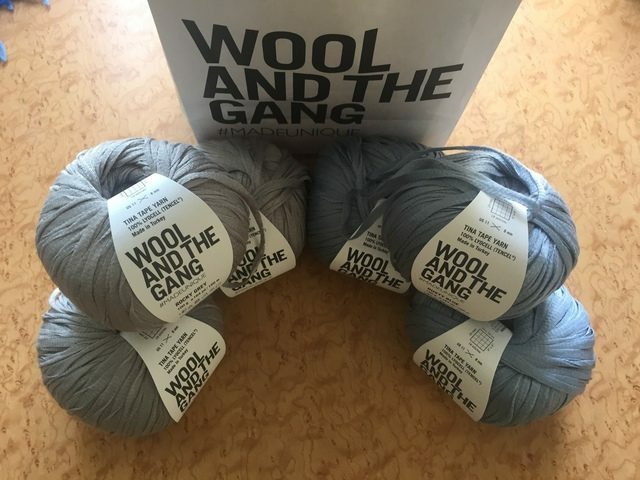 I don’t have a pattern for you but I’ll tell you a little bit about how I made it and lots of info about this fun yarn. “is 100% vegan, uses no harmful chemicals and saves water … (it) uses renewable energy and is made of fibre from sustainably sourced eucalyptus trees” and it is manufactured in an eco-friendly closed loop system. I love that the yarn is eco-friendly, but I also just loved working with the yarn. 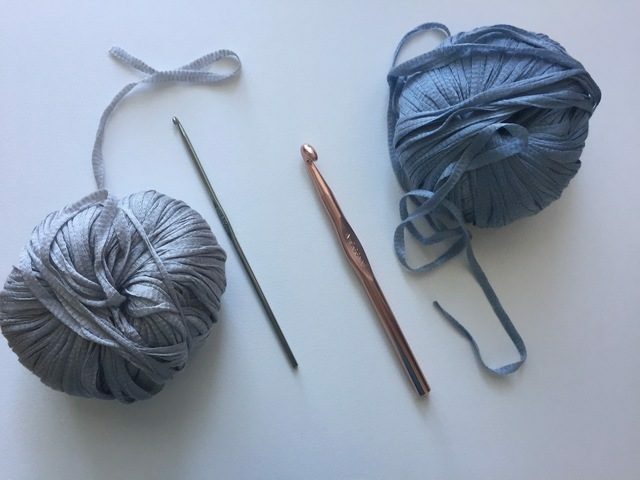 When I first started crocheting, I worked mainly with animal fibers and acrylic. I have a ton in my stash so that is still what I use a lot of, but lately I’ve been preferring to work with cotton and linen. 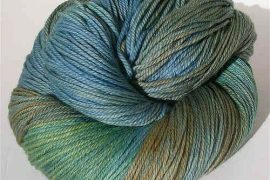 This yarn has the same soft feel as those natural fibers and the same great stitch definition of those yarns. I liked how it felt crocheting with it. 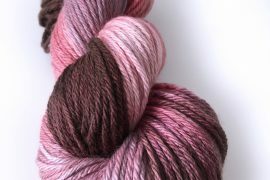 Worn on the body, this yarn has a nice soft texture and great drape with a little bit of weight. It’s perfect for a summer dress but could work for items made in other seasons as well. 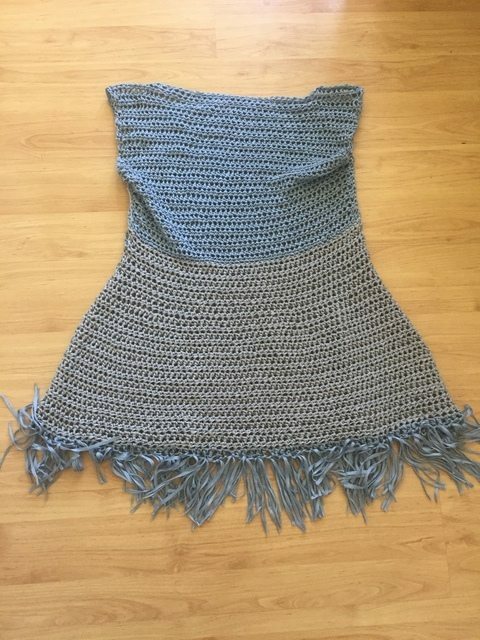 I worked my crochet dress using a mid-sized hook but played around a lot with how the yarn looks using other hook sizes and I found that it’s a very versatile yarn. 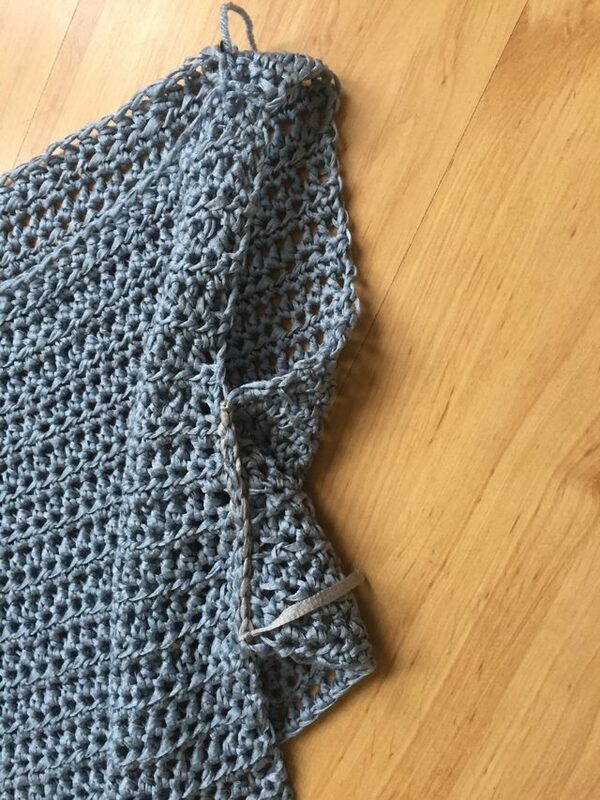 I actually liked the effect of it worked with a small size E crochet hook but it can also look great in a very openwork stitch made with a larger hook. 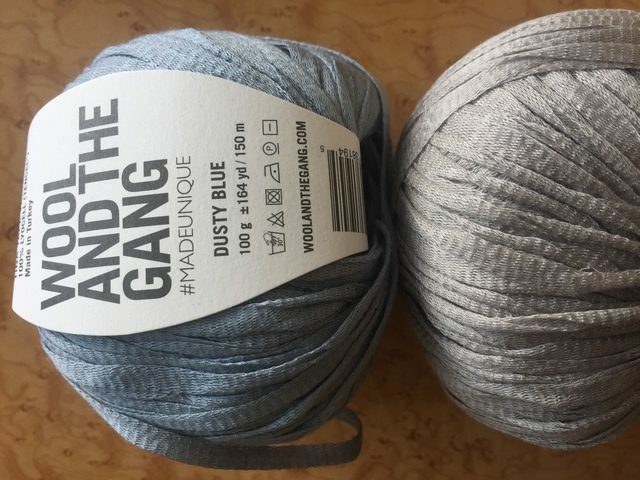 I used the Dusty Blue and Rocky Grey colors of this yarn. I love how the colors are soft but rich, and I especially liked how they looked together. 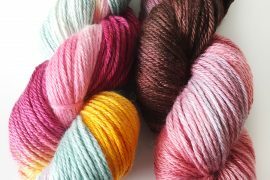 The yarn comes in ten other colors in addition to these, mostly in the same soft hues with a few brights thrown in. As I said, I don’t have a crochet pattern for this dress. But for those who are interested, I’ll tell you a bit about how I approached its construction. I used only half double crochet stitches to make this simple dress. 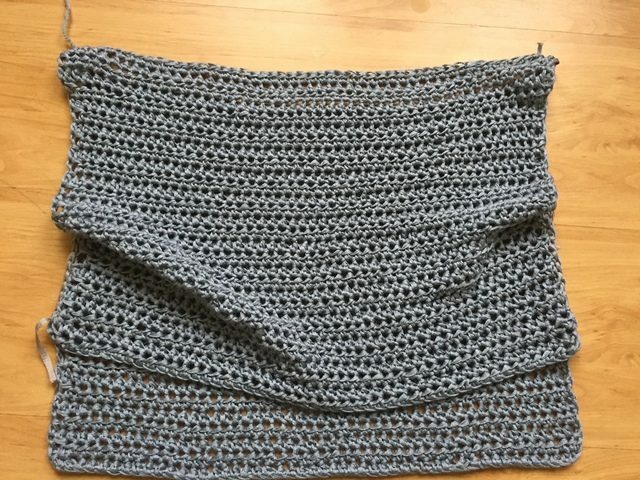 Using an I hook, I crocheted two rectangles that were fifty stitches across, each of which used an entire ball of the grey color of the yarn. I then seamed these two rectangles together to create the neckline and arm holes. First, I held the two rectangles together and began at one corner of the top, stitching ten stitches in to close the right side of the neck. I repeated on the other side to close the left side of the neck. Then I seamed together the sides, leaving enough room open for the arm holes. What I did to give some shape was that I pulled the bottom of the front rectangle up higher than the back, seaming the sides this way for less of a boxy shape. I added fringe, which is perfect in this tape yarn! I love twirling like a kid in this skirt! It looks better with a belt so I’m either going to make one with the remaining yarn or perhaps just thread a crocheted chain of the yarn through where I want the “belt” to be and make a bow of it. 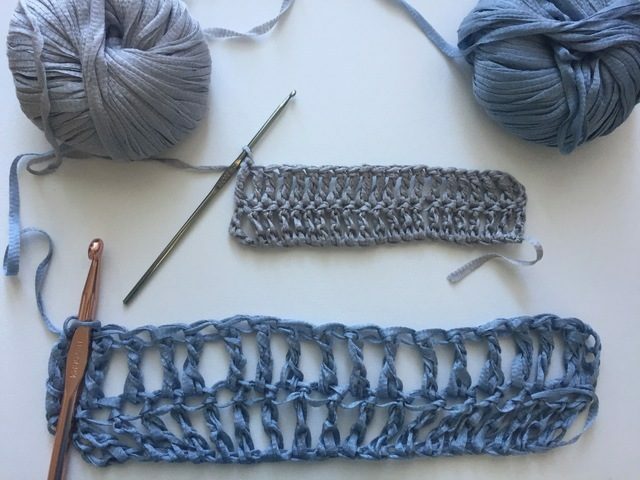 You can also always share what you make on social media using the tag #shareyourknits and in this case also tag your photos with #tinatapeyarn. I’m always looking for sustainably produced yarns. Thanks for this post.